State Route 34 (Faulkland Road) connects areas of northwest Wilmington and the town of Elsmere with the Delledonne Corporate Center as a minor arterial west from SR 100 (South Dupont Road) by the Oak Hill and Willow Run communities to SR 141 (Centre Road). West of Ferris School to Centre Road, Faukland Road travels through the residential areas of Woodland Park, Brookland Terrace and Faulkand Heights before descending into a steep valley fed by Red Clay Creek. 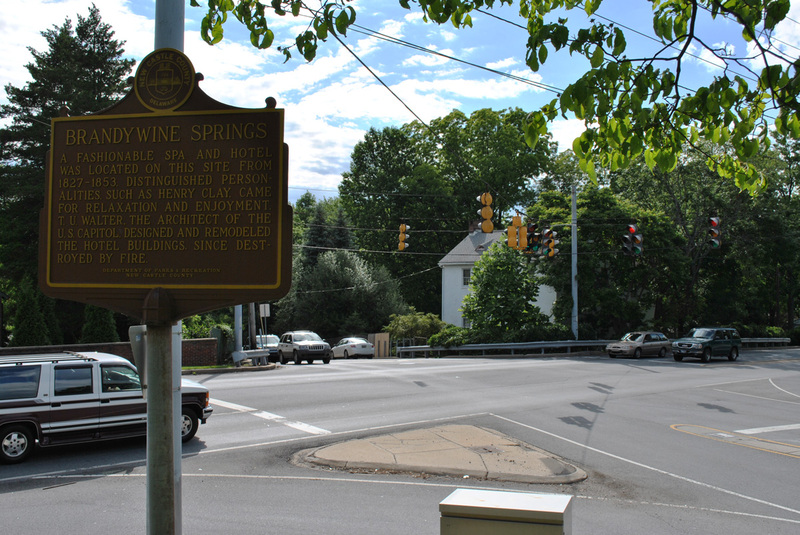 The winding and scenic stretch passes through Brandywine Springs County Park between the Wilmington & Western Railroad and SR 41 (Newport Gap Pike). The state route concludes with a dangling end at Duncan Road by the Hyde Park subdivision. Duncan Road leads south to SR 2 (Kirkwood Highway) and north to Decastle County Park. Delaware 34 (Faulkland Road) and 41 (Newport Gap Pike) converge by Historic Brandywine Springs Park. Photo taken 06/05/12. A Hazard Elimination Program (HEP) project scheduled to start in Spring 2019 improves the intersection of SR 34 (Faulkland Road) and SR 41 (Newport Gap Pike). Addressing a large number of accidents, work will lengthen the left turn lane from SR 41 south to SR 34 east by 400 feet. Concrete medians will be removed and traffic signals will be upgraded. Construction run approximately six months. Duncan Road north links Milltown Road with the eastbound beginning of Delaware 34 (Faulkland Road). Photo taken 12/20/17. Duncan Road branches southeast from McKennan Church Road to intersect Delaware 34 (Faulkland Road) east midway between Delcastle County Park and Delaware 2 (Kirkwood Highway). Photo taken 12/20/17. Faulkland Road lowers by the Hyde Park subdivision to cross Hyde Run on the initial stretch of SR 34 east from Duncan Road. Photo taken 12/20/17. SR 34 (Faulkland Road) crosses Hyde Run ahead of SR 41 (Newport Gap Pike). The 26.9 foot span here dates back to 1922.1 Photo taken 12/20/17. 0.23 miles east from Duncan Road, SR 34 (Faulkland Road) intersects SR 41 (Newport Gap Pike). SR 41 originates 1.01 miles to the south at SR 2 (Kirkwood Highway) and SR 62. Photo taken 12/20/17. Econolite traffic lights in use at SR 34 (Faulkland Road) and SR 41 (Newport Gap Pike) and the northwest corner of Brandywine Springs County Park. SR 41 forms a multi state route with PA 41 north from Prices Corner to Gap, Pennsylvania. Photo taken 06/23/12. Reassurance marker for SR 34 east posted between SR 41 and the parking lot for Brandywine Springs Park. Photo taken 12/20/17. Brandywine Springs Park was once the site of a spa and hotel from 1827-53. Park amenities include baseball fields, a basketball court, a playground, picnic pavilions and hiking trails to the historic sites along Red Clay Creek. Photo taken 06/05/12. Delaware 34 (Faulkland Road) descends over 100 feet in elevation along Brandywine Springs Park. Photo taken 12/20/17. Second photo taken 06/23/12. Faulkland Road crosses Red Clay Creek and the Wilmington & Western Railroad at the base of the valley between the Brandywine Springs Manor and Faulkland Heights subdivisions. Photo taken 12/20/17. SR 34 emerges from the Red Clay Creek valley ahead of the signalized intersection with Centerville Road by the Tybrook and Brookland Terrace communities. Centerville Road leads south to Prices Corner and north to SR 48 (Lancaster Pike) by the Little Falls Centre business park. Photo taken 12/20/17. SR 34 is a concrete road east of Centerville Road. A trailblazer appears at Woodland Park, just ahead of Little Mill Creek. Photo taken 03/20/04. Kendall Road north and Wagoner Drive south tie into Faulkland Road from the Woodland Heights subdivision at succeeding eastbound signal. The driveway to the Delaware Youth and Family Center connects from the north. Photo taken 12/20/17. SR 34 (Faulkland Road) widens to four lanes through the intersection with SR 141 (Centre Road) by Chestnut Run Shopping Center. SR 141 angles southwest to SR 2 (Kirkwood Highway) and Prices Corner. Centre Road south to the interchange with SR 2 was expanded to include a raised median and wider travel lanes by November 2010. Photo taken 12/20/17. Delaware 141 (Centre Road) continues north from Delaware 34 by Delledonne Corporate Center as a controlled access arterial to Barley Mill Plaza, and a short freeway from there to Greenville. The belt route around Wilmington was previously proposed as a full freeway, with an interchange planned at Faulkland Road. Photo taken 12/20/17. Faulkland Road continues east from SR 141 by Delledonne Corporate Center and the Willow Run neighborhood. Expansion of SR 34 in 2010 extends to just beyond Willow Run Drive. Photo taken 12/20/17. Faulkland Road crosses Chestnut Run beyond this reassurance marker after Montgomery Road. Photo taken 12/20/17. SR 34 (Faulkland Road) east at the signalized entrance to Delledonne Corporate Center and Montgomery Road south into the Willow Run community. Photo taken 12/20/17. Oak Hill Road north and the east access road to the Deledonne Corporate Center come together at this traffic light in the Oak Hill community. Photo taken 12/20/17. SR 34 advances east from Oak Hill Drive to an at-grade crossing with the Delaware Valley Railroad. Photo taken 12/20/17. SR 34 (Faulkland Road) expands to four lanes on the approach to SR 100 (South Dupont Road) between Beth Emeth Memorial Park and Silverbrook Cemetery. Photo taken 12/20/17. Faulkland Road curves southward to end at Delaware 100 (South Dupont Road). Delaware 100 travels 0.68 miles south to intersect Delaware 2 (Kirkwood Highway) in the town of Elsmere. Photo taken 12/20/17. South Dupont Road leads SR 100 east 0.23 miles to SR 48 (Lancaster Avenue) by the Greenhill neighborhood of Wilmington. Photo taken 12/20/17. SR 34 (Faulkland Road) branches west from SR 100 (South Dupont Road) at Lancaster Village and Silverbrook Cemetery. Photo taken 12/20/16. This confirming marker for SR 34 west was removed during expansion of Faulkland Road ahead and after SR 141 (Centre Road) in 2010. Photo taken 03/20/04. The ensuing westbound signal operates at the entrance to the Delaware Youth and Family Center and Wagoner Drive south into the Woodland Heights subdivision. Faulkland Road reverts to a concrete roadway from this point west to Centerville Road. Photo taken 06/05/12. Centerville Road heads northward from SR 62 (Boxwood Road) and SR 2 (Kirkwood Highway) at Prices Corner to intersect SR 34 en route to SR 82 (Campbell Road) at Hoopes Reservoir. Frontage streets accompany Faulkland Road west for the Tybrook and Faulkland Heights neighborhoods. Photo taken 06/05/12. Delaware 34 (Faulkland Road) drops around 100 feet in elevation from Marlyn Drive into a valley fed by Red Clay Creek. Photos taken 06/05/12. Delaware 34 crosses both the Wilmington and Western Railroad and Red Clay Creek at the base of the valley. Photo taken 08/05/07. Faulkland Road climbs westward to Brandywine Springs County Park ahead of SR 41 (Newport Gap Pike). Photo taken 12/21/17. SR 34 and SR 41 come together northwest of Brandywine Springs Park. Following Newport Gap Pike, SR 41 travels south to SR 2 and SR 62 at Prices Corner and north to Hockessin and Chester County, Pennsylvania. Photo taken 12/20/17. Faulkland Road lowers to cross Hyde Run on the 0.23 mile segment between Delaware 41 (Newport Gap Pike) and Duncan Road. Photo taken 12/20/17. An end SR 34 shield appears at the intersection of Faulkland Road and Duncan Road. Duncan Road connects the state route with Milltown Road to the south and McKennans Church Road to the north. Photo taken 06/05/12. Second photo taken 12/20/17. A trailblazer for SR 141 precedes the intersection with SR 34 (Faulkland Road) on Centerville Road northbound. Photo taken 12/21/17. SR 34 shield assembly posted southbound along Centerville Road. Photo taken 12/21/17. SR 34 (Faulkland Road) heads east to Woodland Park, SR 141 (Centre Road) and Elsmere from Centerville Road. Frontage streets accompany the state route west at Faulkland Heights and Tybrook before the descent into Brandywine Springs Park. Photo taken 12/21/17. Faulkland Road - Proposed Declassification of Delaware Route 34. Delaware Department of Transportation. FAULKLAND RD over HYDE RUN, New Castle County, Delaware. BridgeReports.com.